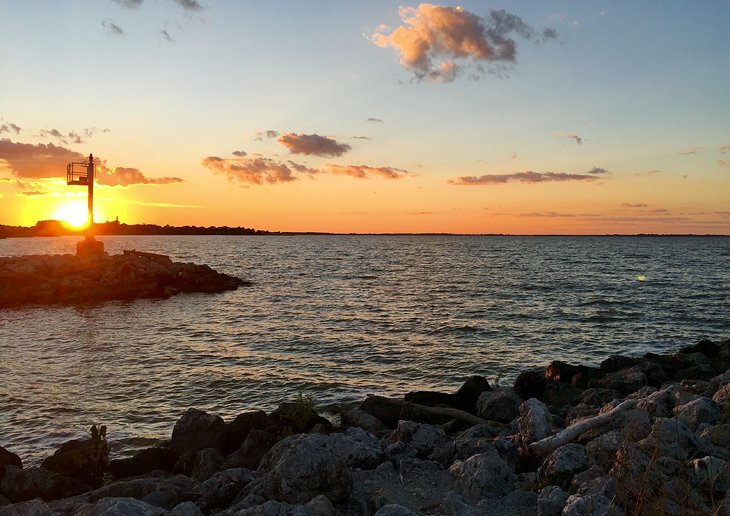 Maumee Bay State Park is on the shores of Lake Erie and it is one of the most naturally diverse locations in the state, with marshes, wetlands, and meadows. Water activities like boating, fishing, swimming, and paddle boarding are usually combined with land activities during a visit. The state park has numerous trails for recreational activities including specific trails for backpacking, mountain biking, All-Terrain Vehicles (ATVs), and snowmobiles. Bike trails and horseback trails are easy to find, and a golf course is also on the grounds. One of the most popular activities at the state park is bird watching as more than 300 species of birds have been identified in the area, including nesting pairs of bald eagles. The park sits along part of the 312-mile Lake Erie Birding Trail. Every spring, thousands of bird watchers come to the area for the Biggest Week in American Birding to witness the warbler migration. The largest state park in Ohio is Salt Fork in Guernsey County, with more than 17,000 acres of recreation. People travel here for abundant hiking, horseback riding, fishing, camping, swimming, and boating. One of the unique features here is a 10-station archery trail that is easy to navigate and easy to find near the entrance of the park. Salt Fork Reservoir is a nearly 3,000-acre lake making it one of the main draws of the region. There are two marinas, and the lake has ample room for boating, water skiing, and fishing. Salt Fork also features one of the largest inland beaches in Ohio, spanning 2,500 feet, with modern amenities like showers and lockers so it is convenient to spend a day. The park has 14 hiking trails with varying degrees of difficulty. Some of these trails are converted to snowmobile trails in the winter.